Black flies are a group of very small flies (Diptera) belonging to the Simuliidae. There are more than thousand species from numerous genera, and many of them feed on blood of birds or mammals, including humans, livestock, dogs and cats. They have several popular names depending on the region: buffalo gnats, white socks, turkey gnats, sandflies, etc. Simulium, found worldwide, with many species that occur only in specific endemic regions. Simulium damnosum is a species abundant in Africa that is the vector of human onchocerciasis or river blindness caused by a filarial worm of the genus Onchocerca. The same disease is transmitted by Simulium callidum, Simulium metallicum and/or Simulium ochraceum in Central and South America. Simulium columbaczense is found along the Danube in Central Europe and is known to sometimes produce enormous swarms that can kill livestock by the thousands. Cnephia with 9 different species. Cnephia pecuarum is found in North America. Austrosimulium, found in the Pacific. Within a particular endemic region dozens of species may be found in slightly different environments. About 50 different black fly species are known to occur only in Germany. Black flies are also vectors of various Onchocerca worms that infect cattle or dogs. Are animals infected with black flies contagious for humans? No, but... Black flies will bite many mammals, including humans, but they do not remain on their host for a long time, won't fly from an animal to a human person directly and usually they do not get indoors. See the life cycle below for more details. You can find additional information in this site on the general biology of insects. Adult black flies are rather small flying insects, not longer than 1-5 mm long, with two wings. 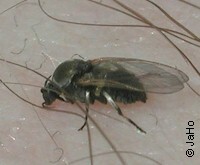 They often have a black color, hence their name "black flies". Whereas the males feed on plant juices, females feed on blood and have mouthparts adapted for piercing the skin and sucking blood. Females lay about 400 eggs in the vegetation or objects close to the water of swiftly-running, well oxygenated streams. Larvae hatch 5 to 30 days later and live underwater attached to the vegetation. Pupation after several molts is completed underwater in about 2 weeks. Adults of some species can fly very long distances (up to 100 km!) in search of suitable hosts. But they do not live more than 4 to 8 weeks. In endemic regions black flies tend to hatch almost altogether in a narrow period of time, which leads to the sudden building of swarms. These swarms can fly hundreds of km, helped by the wind, in search of adequate hosts. Swarms and individual flies are active only by daylight and will rest during the night. In regions with temperate climate and cold winters black flies have a seasonal development and populations peak from late spring to late summer, depending on weather conditions and availability of food. The bite of a black fly is initially not painful because an anesthetic is injected with the saliva. But the saliva includes histamine, a well-known skin irritant, as well as a powerful anticoagulant to avoid blood clogging, and other allergenic and toxic molecules. All these substances and the piercing of the skin cause a strong itching and skin irritation soon after the bite. These symptoms can last for weeks, both in animals and humans. In case of numerous bites stronger allergic reactions can cause headache, fever, nausea and other symptoms, also known as "black fly fever". 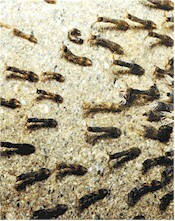 Single bites are not a problem for livestock, but the large swarms that appear occasionally can be devastating in endemic regions. Animals panic and run away uncontrolled, traying to escape the swarms. This and hundreds of bites can cause massive stress, skin irritation, and allergic reactions than can end in heart failure. Various well documented outbreaks in the Danube in the last century killed more than 20'000 domestic animals: cattle, horses, sheep, pigs, etc. Various measures have been used in endemic regions to reduce the number of larvae developing in the streams. Since a rich oxygenation of the water is a must for the larvae, slowing down the water flow (e.g. with dams) can reduce or even eliminate many breeding places. Chemicals to kill the larvae (larvicides) in the water are seldom acceptable because they will also kill numerous beneficial invertebrates, but is sometimes done in regions where human river blindness is endemic. Good results have been also obtained treating the breeding places with Bacillus thuringiensis, a microorganism that can kill insects quite selectively. In some endemic regions insecticides (e.g. synthetic pyrethroids) are used to treat the vegetation surrounding the preferred breeding places. This kills freshly hatched adult flies that congregate there by the millions before flying away in search of food. There are currently not many insecticides that effectively protect livestock or pets against black flies. Ready-to-use pour-ons (mainly with synthetic pyrethroids) may protect cattle against black flies for several days, insecticide-impregnated ear-tags for several weeks. But most such products are not approved for use against black flies, which means, that their efficacy against black flies has not been investigated by the manufacturer for whatever reason (often because the market is too small, or because the required dose of the active ingredient would be too high). The same applies to spot-ons (=pipettes) and insecticide-impregnated collars for dogs or cats. There are no products for internal use (injectables, drenches, tablets, pills, etc.) that will protect livestock or pets against black flies. There are no really effective repellents to keep black flies away from livestock or pets more than a few hours, if ever. There are no vaccines to protect dogs or cats, humans or any other animals against black flies. So far there are no effective biological control methods against black flies. Learn more about biological control of flies and other insects. There are reports on black fly resistance (mainly larvae) to organochlorines, organophosphates, and synthetic pyrethroids in Africa and Latin America. It is thought that it is rather a consequence of crop pesticides being regularly washed out into the streams where black fly larvae develop.